Hospitals constantly grow and evolve, but one thing that remains constant is the critical need for reliable power. 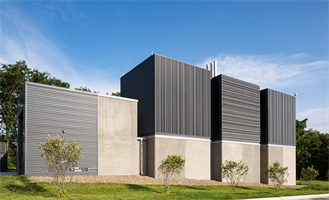 For this project, the demands of an expanding UIHC medical campus led planners to seek a remote site for a new emergency power facility to serve the new Stead Family Children’s Hospital. 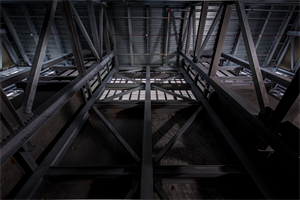 The facility needed to be expandable and robust enough to withstand 170 mph winds. The site is a small pocket of land between a University of Iowa commuter parking lot and Finkbine Golf Course. The smallest possible footprint for the building was needed to preserve an existing tree buffer at an adjacent golf green. 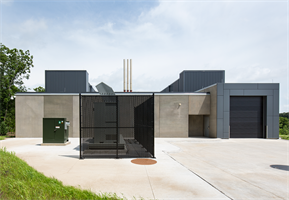 The design team developed an efficient plant layout that features two double-loaded ventilation shafts that meet the massive air flow requirements of the generators without increasing the building footprint. 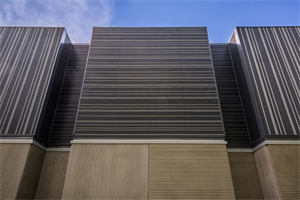 The louvered shafts added the benefits of eliminating direct lines of impact for wind-born projectiles hitting the engines, along with increasing the overall security for the uninhabited facility. 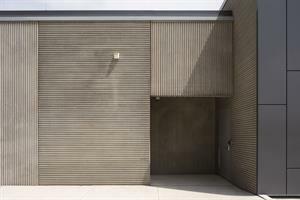 Aesthetically, the challenge was to reduce the scale of the building that sits alone in a public setting. 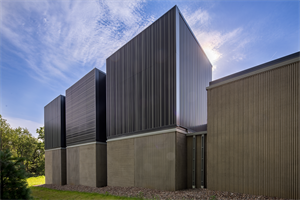 The design team expressed the modular nature of the plant on the facades and added a deep texture with multicolor louvers and form-liner precast to bring the largest individual surface of the building skin down to the width of a few fingers. 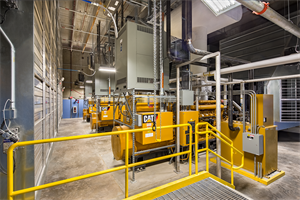 The facility can provide 6 megawatts of fully distributed power in less than 9 seconds.